To look at reducing cost (while maintaining performance) consider implementation cost – the total cost of assembly, board design, component storage and handling. In Microwave assemblies the replacement of chip-and-wire assembly with pick-and-place technology has enabled significant reductions in manufacturing costs. Avoiding mixed technologies and designing for automated assembly and SMT placement where possible reduces manufacturing complexity and cost, while improving quality. Further, avoiding chip-and-wire chip-and-wire minimizes parasitic inductance from wire bonds, removing the need for post assembly tuning of the filters if they are made in a repeatable process. Microwave filters in a surface mount package with repeatable performance become key enablers in reducing overall system cost. But what about size? Why not implement the filter directly on the PCB and avoid filter components altogether? Well one reason we already touched on is repeatability – filter components that are manufactured in a repeatable process and tested to specification before they land on the board are potentially less costly than having to correct variations in PCB implemented filters in a ‘set at test’ manner. The goal is cost effective tuning free assemblies even at mmWave frequencies. Secondly is size – filters and dividers/splitters implemented in a surface mount package can be up to 20x smaller than an alternative printed directly onto a PCB board. You can see why in our blog post Microstrip Filters deliver small size at high frequencies. 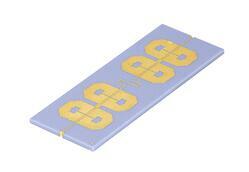 Surface Mount Microwave filters reduce cost, complexity and size. To learn more about how SMT filters play a role in 5G mmWave systems download our Whitepaper Reduce Cost and Complexity in 5G mmWave systems with Surface Mount Solderable Filter Components.